Is the Jeep Wrangler a Comfortable Vehicle? The Jeep Wrangler is a popular compact SUV that's comfortable to drive. Among its many interior features, two that stand out for comfort are the ergonomic seats and the built-in 8.4" touchscreen. The Jeep Wrangler's seats were designed to deliver good support and comfort, letting you drive pain-free for long periods. On cold days, you can turn on the front seat heating to warm up faster. For better back support, the driver's seat has a two-way lumbar adjustment. People in the back seat have a lot of leg room as well. The 8.4" touchscreen adds comfort to the compact SUV because it's large enough for you to easily read the screen. 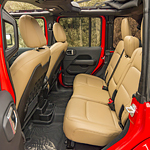 Equipped with comfortable interior features like ergonomic seats and a built-in 8.4" touchscreen, the Jeep Wrangler is a comfortable compact SUV. You can test drive the Jeep Wrangler at Chilson Chrysler Dodge Jeep Ram FIAT.